As Annica Cuppetelli’s research has revealed, contemporary women are still routinely subjected to garment-based forms of discrimination. 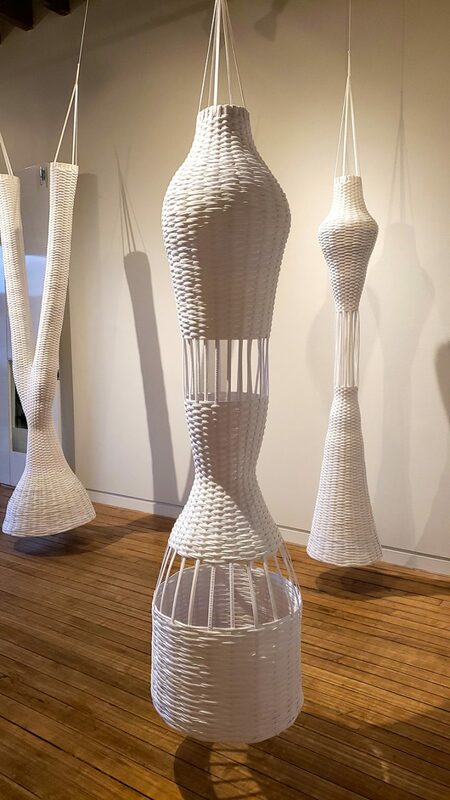 Cuppetelli’s forms float from hanging wires, emerge from walls, and occasionally lounge on shelves — part basket, part specter, part anatomy of an organism — creating an odd sense of tension between anonymity and figuration. The first human-scale sculpture a viewer encounters, and the one that most closely resembles a conventional silhouette, is titled “18 Inches.” The title refers to the ideal waist measurement for women in the 18th century. Simply as a concept, this measurement is offensive; to see it presented in physical space drives home the exact dimensions of female oppression. But for Cuppetelli, this is not a theoretical exercise in outmoded patriarchy. As her research has revealed, contemporary women are still routinely subjected to garment-based forms of discrimination. “I think the first woman wore pants on the Senate floor in 1995, maybe?” she said. It was actually 1993, when freshman Illinois Senator Carol Moseley-Braun inadvertently shattered the taboo by wearing a pantsuit that she had no idea flew in the face of 229 years of Senate tradition. And though I consider it a jaw-dropper that women were professionally discouraged from wearing completely socially conventional clothing in their workplace, a central conceit of Cuppetelli’s work — both in its conception and in its making — points to one of those insidious contradictions we are experiencing at this moment in time as women. “I still want these to be really beautiful, and I want them to exist as objects,” said Cuppetelli. Here is the real crux of the issue: As women, as artists, as citizens, we can hope and fight for and demand respect and professional equity, but we are still undermined by notions of beauty, approval, and acceptance that are based on thousands of years of male-centric society. Perhaps previous generations of women had to physically wrestle themselves into corsets — or, adding another layer of class and race division, were laced into corsets by domestic help — but Cuppetelli’s work is merely a very literal demonstration of women’s continued wrestling with the corset, whether we are physically inside one or not. To pretend that Cuppetelli’s hospitalization in the course of grappling with ideal female measurements is unique is to be willfully oblivious to the scourge of eating disorders, diet pill abuse, limb dislocation, and a host of other mental and physical health complications associated with the cultural obsession with female thinness. The terrible paradox of our moment in womanhood is perhaps about wanting freedom, but then still actually wanting … compliments? It’s a question that leaves me a little short of breath. I may heave a sigh of relief that is only possible because I’m no longer socially obligated to wear a garment that prevents me from drawing air, but letting go of the need for being recognized as beautiful according to ideals literally defined by the history of corsets is much harder to let go. Cuppetelli’s sturdy, spectral creations stand painfully at the crossroads of contemporary feminism. 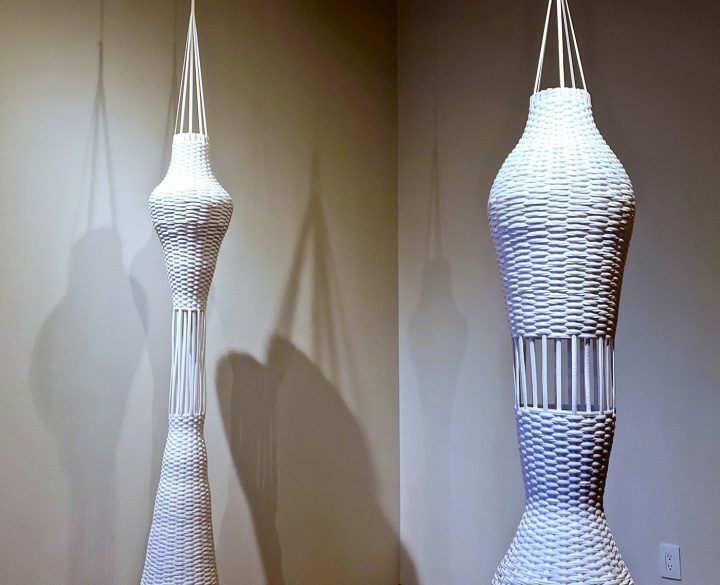 Measures of Constriction by Annica Cuppetelli continues at K. Oss Gallery (1410 Gratiot Ave, Detroit, Michigan) through March 2.